In fall 2015, the Ventura County Watershed Protection District completed construction of an engineered bioswale to capture low flow runoff from El Roblar Rd in Meiners Oaks. This County project was funded through a Prop 84 Stormwater Grant in partnership with the Ojai Valley Land Conservancy and is located within Land Conservancy's Meadow Preserve. The Surfrider Foundation and other organizations contributed letters of support for the project. The completed project is shown here post-construction (photo taken Nov'15.) Note the seeding, planting, and irrigation. Vegetation should fill in with the upcoming winter rains. 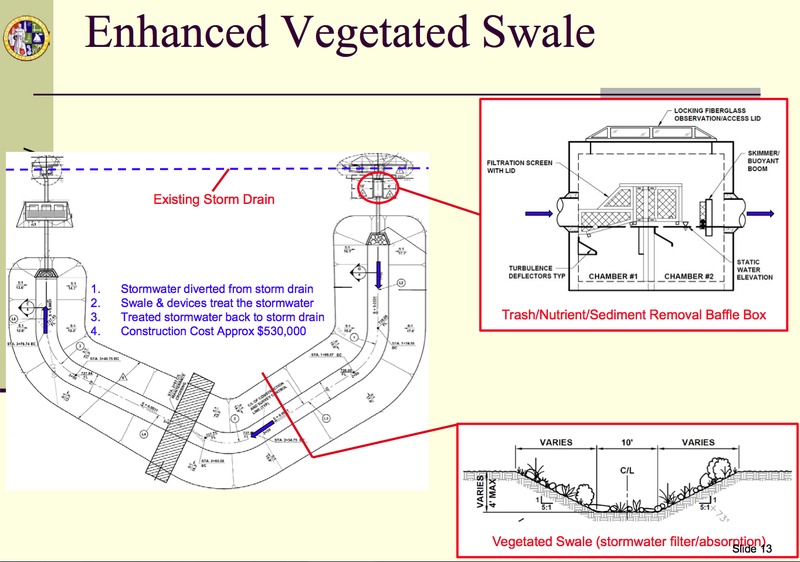 The swale is designed as treatment diversion, taking runoff from the street, filtering it, and returning any overflow to the existing storm drain. The engineering features of this project are shown below. Flow enters at the upstream/right side through a storm drain inlet at the curb. Water is filtered in the trash/nutrient/sediment removal baffle box before entering the vegetated swale. 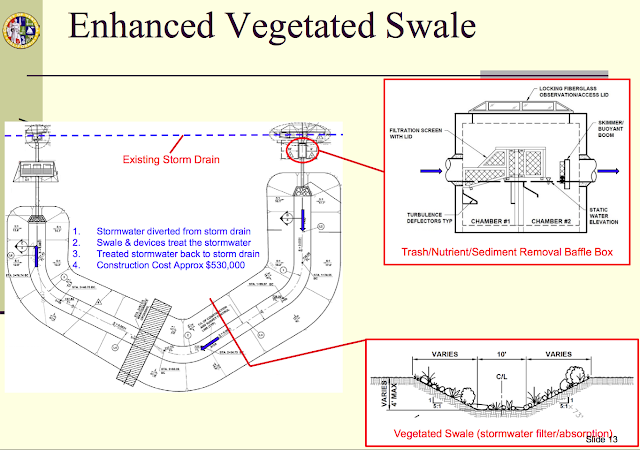 Water that is not absorbed into the ground as it flows through the swale will exit back into the storm drain. 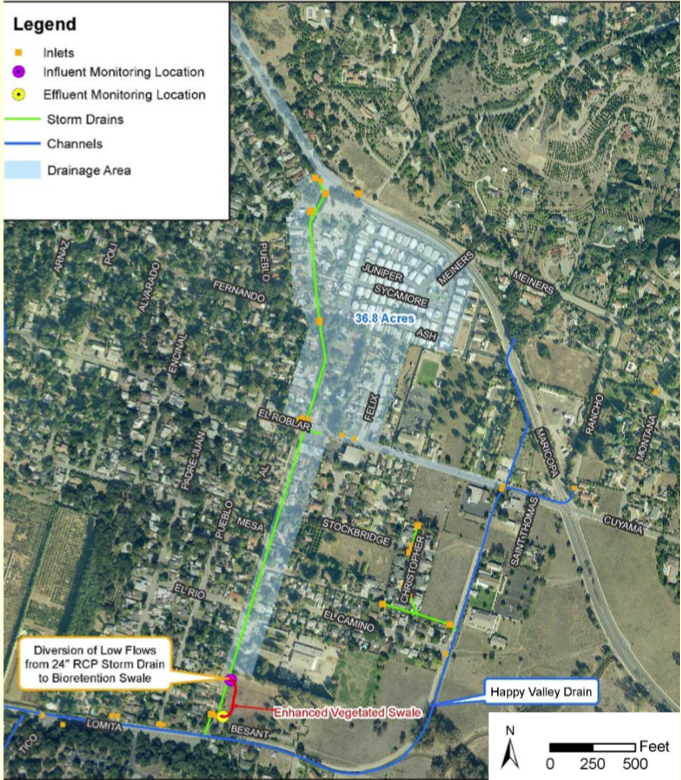 The image below shows the drains within the larger Meiners Oaks area - these storm drains all enter the Ventura River where Happy Valley Drain exits the bluff along Rice Rd (bottom left of the image labeled MO-MEI). 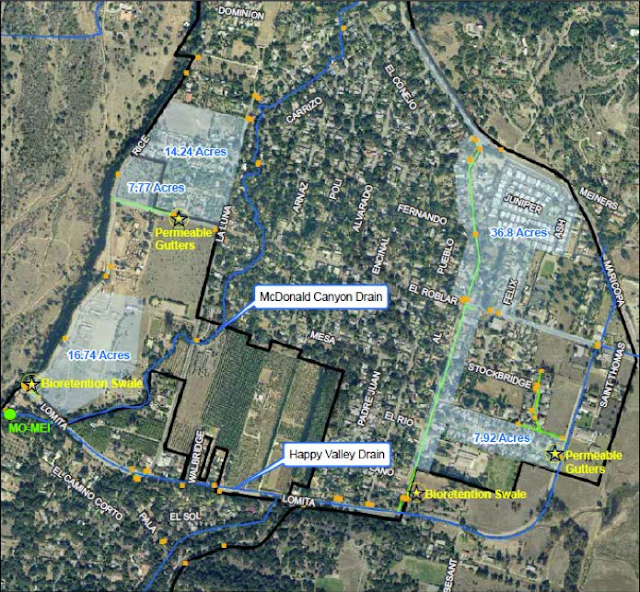 The original proposal included two other projects on McDonald Drain which illustrate components of a regional watershed approach to capturing urban runoff. These components were not funded. The County will be monitoring this project over the coming rainy season to evaluate the effectiveness of the engineered bioswale. Once the vegetation is established they will be measuring flows and collecting influent and effluent samples for BMP effectiveness evaluation to reduce nutrients and other stormwater pollutants.